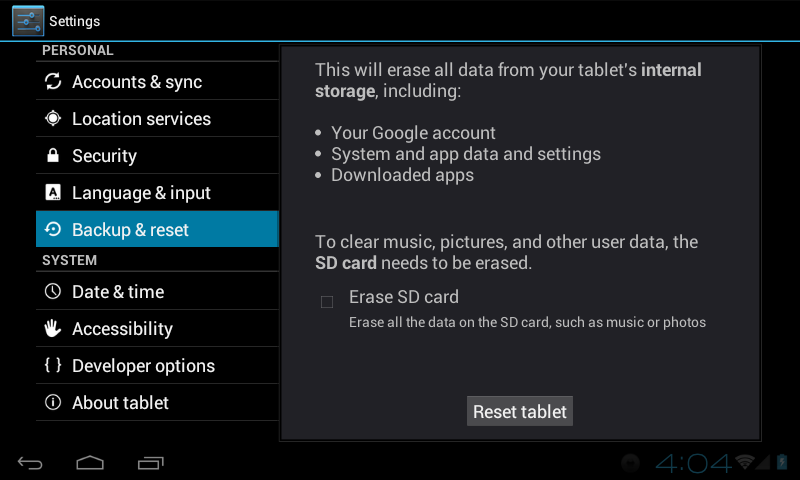 DO NOT perform this factory reset procedure if you have an unlocked tablet and/or a custom recovery!!!! The Factory data reset is a standard feature in Android devices. It is used to clear all user data from the device, and restore it to a clean factory state, as if you had never used the device. This can occasionally be necessary to clear system problems having any number of causes, including problems caused by misbehaving applications. If you have not yet tried a hardware reset in an attempt to resolve the problem you are working on, you should try that first, because that does not affect any of your data. The hardware reset is done by simply using a pin or paper clip to press the button located inside of the pinhole near the lower right hand corner of the tablet. If that does not resolve the issue, then move onto the Factory data reset. The first, easiest, and most commonly used method is to use the Settings control app. This is defined as Method 1 below. The second and more cumbersome method is performed by operating the device buttons in a particular sequence, and is intended for use only when the touch screen and/or the Settings control cannot be used for any reason. This is defined as Method 2 below. Before proceeding with any factory data reset, it is important that you save/backup any files you have stored in the internal memory that you wish to keep -- e.g., documents, photos, movies, music, apps/data, etc. You need to manually save such files to external storage, because all internal user storage on the tablet will be wiped clean. 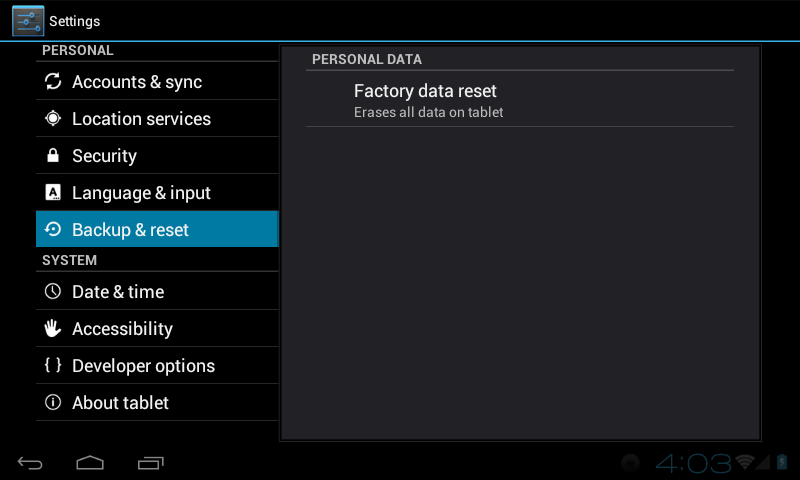 The factory data reset will wipe the tablet completely clean of user data, as if you had never used it. Note that the reset does not change the current operating system that has been flashed onto your ROM. For example, if you are running ICS (4.0.3), the tablet will stay on ICS, regardless of whether or not an earlier version of Android came pre-installed on the device. The OS software itself is not removed or changed by the procedure, but only temporary OS data, cache and user data are cleared. This causes the tablet to boot up to the initial setup screen, where you will have to again set up your wifi, log into google, etc. NOTE: Use only Method 1 or Method 2. There is no need to use the more cumbersome Method 2 if Method 1 can be performed. Both methods accomplish the exact same task. 1.) Ensure that you have backed up any files you wish to preserve as noted above. 2.) Perform a hardware reset by using a pin or paper clip to press the button inside of the pinhole at the lower right corner of the tablet. You should feel a slight click when pressing and releasing the button. Make sure your pin actually contacts the button and is not too tight in the pinhole. The tablet will boot up from the reset. 3.) From the Apps menu, locate the Settings app. 4.) If your system is running ICS (Android 4- SHOWN), then open Settings - Backup & reset. If your system is running HC (Android 3), then open Settings - Privacy. 5.) Scroll down to the bottom of the window, and select Factory data reset. 6.) Follow the on-screen instructions to complete the reset. Upon successful completion, the tablet will boot up into the initial setup screen. Acer Support: Frequently Asked Questions list for Internal Only - How do I perform a Factory Data Reset if my Acer ICONIA TAB does not boot? If you make a mistake at any point, restart the procedure again from step 1. You need to do precisely what the procedure says, in the precise order, and time each action exactly as specified. For step 4 You have to release the power switch in 3 seconds (no more, no less). You have to continue to hold the volume up button after releasing the power button. You have to quickly work the screen lock switch as soon as the tablet vibrates as directed in step 5 (still holding the volume button, but not the power button). If the tablet shows a recovery error or any other unexpected condition, you may have made some mistake in the procedure. For example, if you hold the power button too long this can cause the device to go into a recovery mode. If you encounter this, don't worry. This is a common and correctable mistake. In such a case, just restart the procedure at Step 1. The procedure can take several practice runs to complete successfully. What follows is the step by step procedure. *** The screen lock placement on the Iconia A100/101 is different. The button sequence is still the same as in the video. 1.) Perform a hardware reset by using a pin or paper clip to press the button inside of the pinhole at the lower right corner of the tablet. You should feel a slight click when pressing and releasing the button. Make sure your pin actually contacts the button and is not too tight in the pinhole. The tablet will attempt to boot. Wait 15 seconds for it to settle. 4.) While still holding the Volume up button, press and hold the Power button for 3 seconds and then immediately release it. Continue holding the Volume up button. 5.) The tablet will vibrate in approximately 1-2 seconds after you release the power button, once you feel or hear this vibration, slide the screen lock switch on and off repeatedly while continuing to hold the Volume up button. 6.) As soon as the Erasing Userdata... message appears in the upper left corner of the screen, release the Volume up button and stop sliding the screen lock switch. You should then also see the Erasing Cache... message below that as proof that your device is being wiped. I've heard of people taking a half dozen or so tries to get it to work, so be patient until you get it right. What follows is a method that can be used to isolate problems with apps. Start with a factory data reset as described above. When you set up your wifi at the initial setup screen, do not login to google and do not install any apps from any source. Do not plug in any external storage -- i.e., no SD cards, no USB storage. Do not restore any data from any cloud service -- Be sure to untick the box that automatically restores app from your Google backup. Do not copy in any media or other files -- i.e., don't download a bunch of images, video, or other forms of data yet. Leave the email clients unconfigured for now. Don't change any default options. Test the tablet for a while like this, and become familiar with the behavior. This will be the baseline assessment that you will use to compare with future test results. Then proceed slowly to whatever you think is more likely to be a trigger of the problem you have been seeing, such as setting up email or plugging in a favorite SD card. Test again. If that's OK, move on to changing default options per your preferences, all methodically and slowly, testing until you see the symptoms return. If you still see no problems, move on to Market/Google Play apps, again, methodically and slowly, testing until you see the symptoms return. Last edited by bilderberg; 02-02-2013 at 05:45 PM. Frederuco, UltraDroid, alphawave7 and 4 others like this. This document has cleared up a lot of questions I had - very clear and concise. Thank you. I only proofread and made it look purty! You all get a round on me! Order anything on tap, it's an open tab and I've already tipped the pretty bartender..
Q : If my device is rooted, i will not be able to upgrade OTA ICS. So, if I do factory data reset, do I get back upgrading access? "proud to be an androider..."
If you are just rooted, you should have no problem getting an OTA update. If you changed system files or removed stock apps, you will run into errors. A factory reset did not break root on my A100, I just needed to reinstall SU. An OTA or microSD update will break root though. Last edited by bilderberg; 06-07-2012 at 01:53 AM.